The fact that I grew up in a tropical country really affects my evaluation of clothing quality. Where I come from, 100% cotton items are the bee's knees. Here in my new home Canada; not so much. 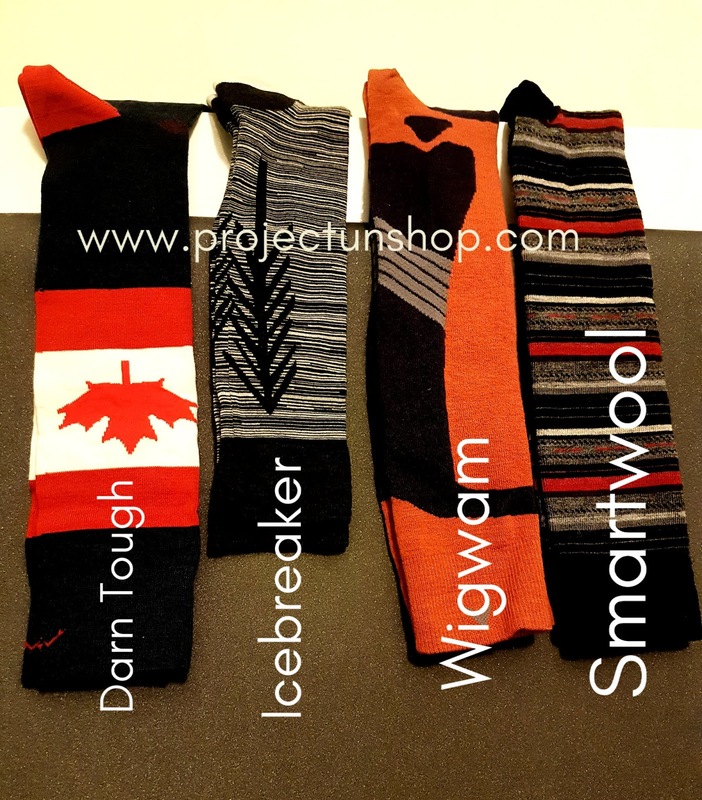 So the engineer in me decided to "test" 4 pairs of wool sock brands through the Calgary grinder this winter. Each pair will go through the same wash and wear cycle and once spring rolls in (hopefully before June!!!) I'll see how they fared. I trolled the sales racks and found deals on all 4 brands that were the focus of my attention. The brands I settled on were Darn Tough socks, Icebreaker, Wigwam and Smartwool. 4 pairs of wool socks later, here are my first impressions of the socks straight out of the box. All are supposed to be over the calf but from the picture above, it's easy to see that "over the calf" is subject to different interpretations. Darn Tough: Beautiful! This was practically knee-high and I love it! Icebreaker: The shortest of the lot. Smartwool: The recommended size for me looked so small in store that I sized up immediately. It ended up being the longest but that may be because I got a Large size, not Medium like the others. While shopping, I noticed other wool socks from recognizable sports brands. On closer inspection, all of those socks had a really low wool content. If I'm paying premium for wool socks, I expect the socks to be at least half wool. Here's how my chosen 4 stacked up. All are more expensive than what I'm used to spending on my beloved cotton socks. All were also hard to find. I lucked out on finding a few pairs of Smartwool in Winners while I had to go to a specialty sports store for the Wigwam and Darn Tough. The Icebreaker socks were ordered online. As most retailers are starting to clear their shelves for the Spring collections, I was able to buy all at discounts of 30-55% off retail. All the socks come with some sort of lifetime guarantee. Time will tell if I actually get to use that.